Some physicists are surprised that two relatively recent discoveries in their field have captured so much widespread attention: cosmic inflation, the ballooning expansion of the baby universe, and the Higgs boson, which endows other particles with mass. These are heady and interesting concepts, but, in one sense, what’s new about them is downright boring. These discoveries suggest that so far, our prevailing theories governing large and small—the Big Bang and the Standard Model of subatomic particles and forces—are accurate, good to go. But both cosmic inflation and the Higgs boson fall short of unifying these phenomena and explaining the deepest cosmic questions. “The Standard Model, as it stands, has no good explanation for why the Universe has anything in it at all,” says Mark Messier, physics professor at Indiana University and spokesman for an under-construction particle detector. To go beyond the models we already have, beyond the confines of the Standard Model, we need some results that we don’t foresee. And when it comes to unexpected results, we expect them from one entity: neutrinos. These particles are abundant, ineffably light, and very weird, but they consistently deliver. Ethereal as they are, neutrinos could make hefty changes to our understanding of the universe if physicists could answer four main questions: How does regular matter affect neutrinos? What causes neutrinos to have mass? Do antineutrinos live different lives from normal neutrinos? And even odder, are these ghostly particles their own antiparticles? The Standard Model, which physicists have populated since the 1950s with quarks, leptons, and force-carrying particles, does not hold the answers. But major neutrino experiments in the US, Japan, and Europe are collecting data while undergoing expansion and construction, and they are gearing up to address these problems. These initiatives could not only unravel the mysteries of the ghostly particles, but the research might lead into larger questions about the nature of all things. What’s the matter with neutrinos? Neutrinos are the second most abundant particles in the Universe (after photons), but they carry no charge and are puny. Neutrinos are at least a million times lighter than an electron, though no experiment has been able to definitively measure their mass. They also barely interact with any matter. They are generated in distant supernovae and travel unhindered through the debris. Neutrinos zip through planets in a single bound without leaving a trace. Billions and billions of them are streaming from the Sun as you read this, blowing through your screen—and through you—without a care. They travel extremely close to the speed of light; so close, in fact, that a tiny error in an experiment designed to measure them was enough to make it appear that they were going faster than that in 2011. But perhaps the neutrino’s strangest property is that they don’t necessarily finish their travels with the same identity that they started it with. In 1998, the 11,000 phototubes submerged in Japan’s Super-Kamiokande underground detector verified that neutrinos coming down through the atmosphere and up through the Earth had different ratios among their identities. Somewhere along their journey from the Sun, they changed type among their three flavors. This oscillation indicated they indeed had mass. If they didn’t, there wouldn’t be anything to switch between. Finding out anything about these particles has been difficult because neutrinos are so notoriously hard to detect and to obtain. But there are now a few ways to do this. Experimenters can nab some from the Sun, like Super-K and many others do. Or they can situate detectors near nuclear reactors, which produce electron antineutrinos. The Daya Bay Reactor Neutrino Experiment in southern China listens to these particles. Finally, physicists can fire up particle accelerators and smash protons into bits of graphite, creating a neutrino spray in the process. The latter is the goal of forthcoming experiments like the Long Baseline Neutrino Experiment, under construction at Fermilab, and the Japanese Tokai to Kamioka experiment, which runs from the seaside town of Tokai to the Super-K detector. Manmade neutrinos are easier to lasso than their incidental brethren, but because of their quantum nature, detecting them is a probabilistic challenge. “Every time we were able to measure a property of neutrinos, we were surprised by it,” says Patrick Huber, a neutrino theorist and associate physics professor at Virginia Tech. What are some of the things that they break? Though neutrinos have vanishingly small masses, regular matter can rub off on them, like a sourpuss spoiling the mood at a dinner party. Robert Wilson, physics professor at Colorado State University and spokesman for the Long-Baseline Neutrino Experiment (LBNE), likens neutrinos to light passing through a filter. Some wavelengths are affected while others aren’t. Similarly, certain neutrino flavors seem to be affected by regular matter as they zip by. Last month, Japanese experimenters demonstrated this oscillation effect by finding that neutrinos shine more brightly at night. As electron neutrinos stream from the Sun toward Earth, they oscillate to muon and tau neutrinos. But as they pass through the dense matter of our planet, some of them switch back. This suggests some quantum-mechanical transformation is taking place as the neutrinos interact with matter in the Earth, specifically its electrons. The electron neutrinos can exchange a W boson, the carrier of the weak force, during this interaction, according to Messier. LBNE will take a hard look at these matter-related effects, which cause droplets of electron neutrinos to appear amid a shower of muon neutrinos. Fermilab’s accelerators will stream neutrinos 800 miles toward a liquid argon detector buried beneath South Dakota bedrock. The detector distances are in a sweet spot that should allow physicists to not only study matter effects, but to also search for clues as to why the Universe contains any matter for them to interact with in the first place. And what of their own masses? The Standard Model can’t explain that either. Based on the variable buzz rate of neutrino masses, physicists have been able to tell that they’re different, although no one is sure how they stack up. 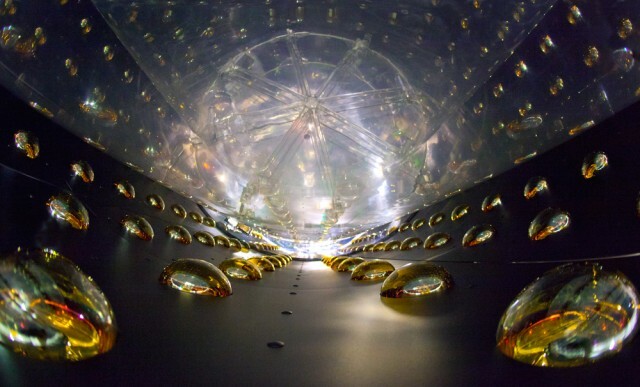 We don’t yet know which neutrino is heaviest, which is lightest. An upcoming detector called the NuMI Off-axis ve Appearance experiment, or NOvA, will help determine neutrino mass hierarchy. NuMI is a neutrino beam at Fermilab; NOvA’s 14,000-ton detector will look for a disparity between departing muon neutrinos and arriving electron neutrinos (ve). Even if this experiment succeeds in generating new mass data, physicists won’t be able to say exactly how that mass arises. Because neutrinos are so much lighter than any other particle, the Higgs mechanism is unlikely to endow them with mass the way it does other particles, Messier says. LBNE, NOvA, and other upcoming experiments will attempt to pull those cracks until the Standard Model shatters completely. From the debris, these research initiatives hope to build a new theory of physics. Enlarge / A diagram of the LBNE’s setup. Along with providing a known, calibrated neutrino source, accelerator beams that produce neutrinos are valuable because they can make antineutrinos, too. This allows experimenters to look for differences in how the two types of particles oscillate. Pinning down the mechanics of neutrino and antineutrino wobbles has important implications for the universe’s asymmetry: why is the Universe filled with something rather than nothing? Physicists use the term charge-parity, or CP, to talk about symmetry between matter and antimatter in the Universe. If there was symmetry, there would not be a Universe. Equal parts of matter and antimatter, having been created in the Big Bang, would immediately cancel out in a flash of radiation. “This is what we might have thought happened, except for the evidence that we exist, which belies that theory,” Wilson deadpans. This means something happened to tip the scales in our favor. Figuring it out could rely on a few key numbers, including numerical values that describe mixing between the different neutrino flavors. LBNE, which will cost $857 million over 10 years, will measure neutrino-matter effects for their own sake, but it should also help physicists suss out the hierarchy of neutrino masses. Knowing those values will allow physicists to study CP violation without any confusing errors, Wilson says. Messier hopes for even more than that. Breaking the paradigm could point to something very strange: the idea that neutrinos are their own anti-neutrinos (which would put them in a group called “Majorana particles”). Such Jekyll-and-Hyde particles are capable of vibrating in two different forms: rather than two distinct entities, one normal and one antimatter, there’s just one individual particle that can be either, depending on how you look at it. The only particles known to live this way are bosons, such as the photon. Physicists could confirm that neutrinos are Majorana particles by searching for something called neutrinoless double-beta decay. Normal radioactive decay happens when an atomic nucleus sheds weight by converting a neutron into a proton, emitting a beta particle—an electron—and a neutrino. This is how an atom of radiocarbon, with its eight neutrons and six protons, transforms into stable nitrogen (with seven of each). Double beta decay is more rare and involves two neutrons simultaneously turning into two protons, two electrons, and two neutrinos. In this case, a heavy isotope would skip a step on the periodic table. In a neutrinoless, bizarro version of this event, a neutron would spit out an electron and a neutrino, which immediately gets absorbed by another neutron. That second neutron also decays but only spits out another electron—the incoming neutrino erases the one that would have been emitted by the second decay. This could happen if neutrinos and antineutrinos are one and the same. An experiment called the Majorana Demonstrator, currently under construction a mile below the Black Hills of South Dakota, will search for this decay in an array of germanium-76 detectors. The LBNE detector, in the same Sanford Underground Research Facility, could also look for these effects. By November 2013, physicists confirmed 28 similar particles, though most were not quite as energetic as Ernie and Bert. (Two other high-energy particles were dubbed Miss Piggy and Mr. Snuffleupagus, according to The New York Times). While searching for additional evidence, physicists spotted a surprisingly ultra-energetic signal, which they nicknamed Big Bird. It packed a wallop—about twice as much energy as Bert and Ernie, scientists reported at a March meeting of the American Physical Society. These high-energy neutrinos are the first astronomical neutrinos to show up in our detectors since 1987, when a supernova in the Large Magellanic Cloud flung some our way. Because these particles are so unlikely to interact with anything on their journey, they can serve as cosmic messengers, allowing physicists to reconstruct their histories. Though trillions of the particles will stream toward them all the time, neutrinos are so hard to detect that the hardware at LBNE, NOvA, T2K, and elsewhere will take years to gather enough of them to sufficiently measure their flips and flavors. Even doing that requires some sleight of hand; neutrinos don’t interact directly, so scientists infer their presence from the tiny flashes of light that other particles emit when a neutrino strikes them. Call it the aroma of the particle’s flavor. Super-K caught their scent by looking for flashes of blue light in a huge vat of water, called Cherenkov radiation. The NOvA detector will use a liquid scintillator, composed of hundreds of thousands of plastic tubes, filled with liquid that shines when particles pass through it. Fermilab engineers designed special glue-robots to glide above NOvA’s tubes, attaching them more efficiently than humans could while dangling from a truss. LBNE will build upon the neutrino-track methods pioneered in Italy’s ICARUS experiment, which uses a high-voltage grid submerged in liquid argon. Advancing physics beyond the Standard Model and potentially approaching a Grand Unification Theory would depend on what the new detectors see. Signals in the LBNE detectors could hint at a possible fourth neutrino, large or small, which would raise entirely new questions about dark matter and the origins of the Universe. Even unmasking the mysteries of neutrinos may not thoroughly explain the matter-antimatter asymmetry, or how the nuclear forces unify, or how those forces relate to gravity, or what constitutes dark matter or, for that matter, dark energy. We could even be totally wrong about all of it, as Huber says. Though the Large Hadron Collider successfully spotted the Higgs boson, as it was designed to do, it has so far been unsuccessful at pushing the limits of the Standard Model. Just as theorists hope to move beyond their decades-old paradigm, Huber suggests physicists switch gears from extra-large colliders to muon storage rings, muon colliders and “neutrino factories,” larger and more precise neutrino beam lines.